Big views from this quaint hill top house. Sun filled rooms with wood floors. Living room has fireplace for cozy winter evenings. Master and two other bedrooms all on the first floor. House has a lower level inlaw suite with full kitchen and fireplace. 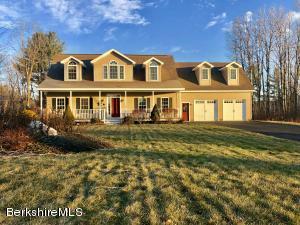 Fantastic large deck for enjoying your views of the Berkshire hills. The roof has solar panels that make annual income (around $2,000) and pay for the electricity. Annual electricity bills total around $100/ year. 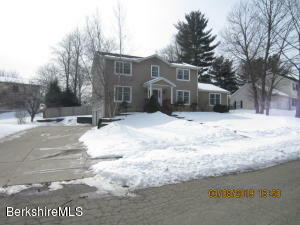 Large yard has a shed and your own apple orchard. House set back off the road on long driveway. Minutes from Skiing Bosquet and a short 7 mile drive to the gates of Tanglewood. 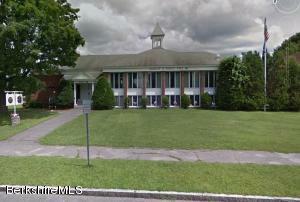 This location is a gem to all your favorite Berkshire activities. Newer roof, new septic system, etc. 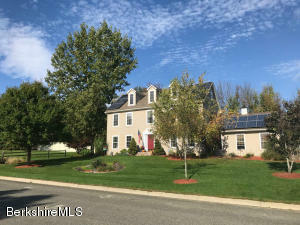 Beautiful home with granite countertops, fireplace, 1st floor laundry, french doors, large master bed w/ walk in closet and bath with jacuzzi tub, screened room, deck and 1st floor bonus area used as in law apartment. Location, Location, Location!! 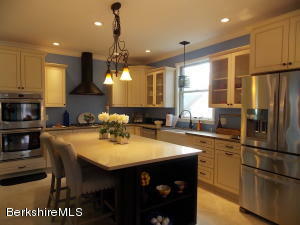 This gorgeous 15 year young colonial in a very desirable neighborhood with a spacious back yard offers 4 bedrooms, 2 1/2 baths, gorgeous updated kitchen with energy efficient appliances including a gas range. Well insulated ... the spacious home cost only $1624.00 for heat, hot water & cooking last year!! 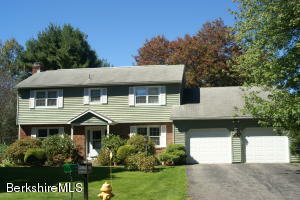 Two car attached garage, very large basement & full walk up attic. Laundry room and 1/2 bath on first floor. Large, level yard. Cul-de-sac Street. One owner home! 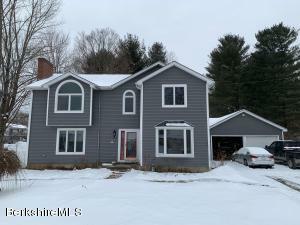 Close to Berkshire Community College, Berkshire Medical Center, Lenox, Tanglewood, Great Shops and Restaurants, Route 7 & Route 20, Only 25 miles to Mass MoCA, MCLA, Clark Art Museum, Williams College & Albany, NY. A must see!! Affordable elegance in this open and bright townhome with stunning kitchen with granite counter tops, a gorgeous island, stainless steel appliances and open view of the dining area and living room. 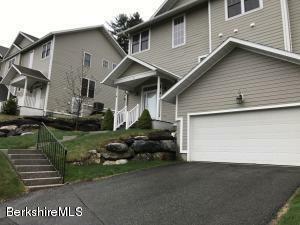 Beautiful wood floors, a gas fireplace, lots of natural light, and access to the screened deck from the living room. There is 3 bedrooms to include a 1st floor Master suite. Custom handrail to the lower level with two bedrooms and family room and has sliders out to the patio. There is a two car attached garage and Central A/C. 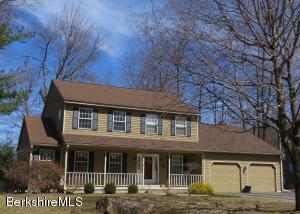 Stunning NE Cape style home complete w/ central air. First level provides a wonderful entertaining space. Sunny eat in kitchen w/ granite, center island, slider to huge deck. Dining area flows nicely into a stone gas fireplace & custom built-in media center. Huge DR with tray ceilings is a favorite spot and add a 4th room w/ French doors which could make for a cozy den, office or play room. 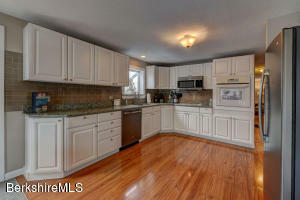 New custom built in mudroom cabinets and hardwood floors on both levels. Spectacular master bath w/ tile shower, glass surround & jacuzzi tub. Finished lower level walks out to blue stone patio w/ fire pit adds an additional 395 sq ft of living space. Huge 2 car attached garage w/ expansion possibilities above. 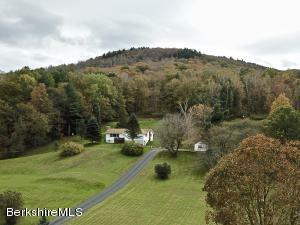 Farmers Porch in front overlooks a pastoral setting and beautiful mountain views. FIFTY SHADES OF WHITE, A SKIERS DELIGHT! Ski out the back door of the townhouse and be right on the trail at Bousquet Mountain. This immaculate 3 bedrooms (two of which are master suites) condominium, is waiting for you. With an abundance of space, no need to be skimpy with your guest list.!! The Pines is a wonderful community that is central to all the cultural and outdoor activities The Berkshires has to offer. Enjoy the enormous in-ground pool and water park in the summer months as well.! This is a fabulous value...don't wait.! 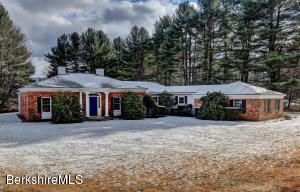 Four bedrooms three- and one-half bath condo in the hill side mountain association of The Pines at Bousquet in the heart of the Berkshires. First floor consists of living room with hardwood floors vaulted ceilings and a gas fireplace. Kitchen with ample cabinet space with Corian counter tops along with an eating area with bow windows overlooking a tree lined back yard. 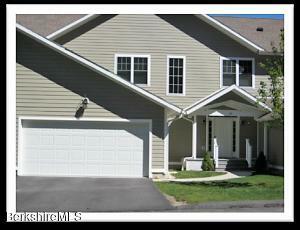 Master bedroom is on the first floor with good sized walk-in closet and master bath with shower stall. 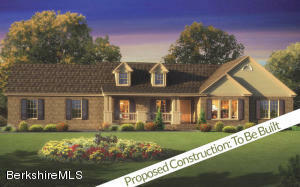 To complete the first floor is a sun room with heat off the living room for overflow room for entertaining year-round. The laundry/mud room is the entry way from the two-car garage. Second floor has three more bedrooms one being another bedroom suite with its own full bath along with a third full bath. 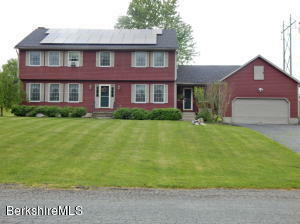 Stunning and glistening move in ready home abutting protected agricultural land. Custom goshen stone walls adorn the landscape, a wrap around deck/porch invites outdoor activities while a finished lower level is perfect for recreation. 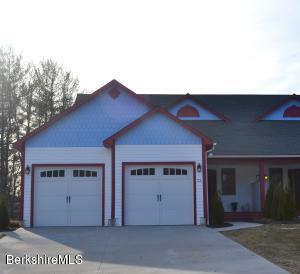 A 20 x 40 detached and heated two car garage with loft is ideal for auto storage and such. The interior has beautiful wood floors, a gorgeous kitchen and a freshly painted interior filled with sunshine. A spacious first floor family room features a fireplace to warm up to and a new natural gas forced air heating and cooling system keeps the home perfectly comfortable. 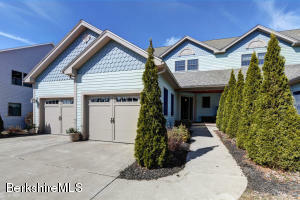 Upstairs you will find updated baths, a lovely master with walk in closet and three more spacious bedrooms. Here, you can simply move in and enjoy the bucolic setting.